That was enough to make me want to hear him speak. It’s not often that I’ve had the chance to hear from someone who has an actual grasp of what peace should mean. Quakers talk a lot about peace, but in Canada there are not many of us (thankfully) who have personally experienced real, actual… NOT peace. Dr. Abuelaish took the stage as our ears still echoed with the sounds of his own sobbing, originally heard via cell phone on national Israeli TV three years ago, only moments after Israeli bombs ripped through his own home, killing three of his eight children and one of his nieces. His composure, when he reached the podium, was remarkable – but not, I think, completely intact. He spoke of his deceased daughters – as well as his living children – with love and pride radiating from him. His life now is lived in their honour. 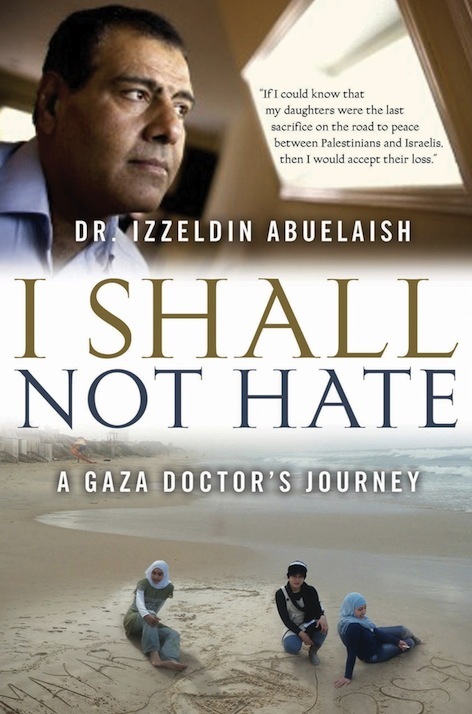 Dr. Izzeldin Abuelaish is an amazing example of humanity. 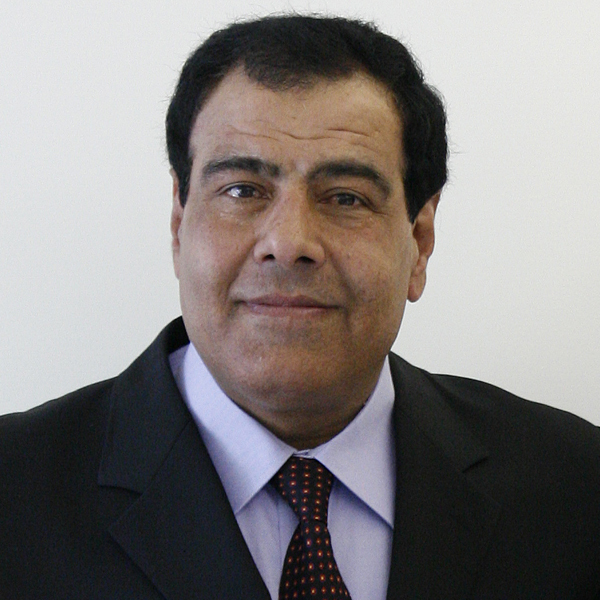 He was born and raised in a refugee camp in Gaza, and somehow managed to make an enormous success out of himself, studying medicine and obstetrics/gynecology in Egypt, England, Israel, Italy, Belgium, and the U.S. (Harvard). That is an extraordinary story in itself. His unprecedented position as the first Palestinian doctor at an Israeli hospital was even more inspiring, showing the public that he was serious about building bridges between warring factions, and working in the best interests of his fellow humans. But really, his position now is even more astounding – I’d even call it revolutionary. Watching the above video, you may have noticed that even when he conveys great sorrow, even though you can tell he acutely feels the injustice, he doesn’t show anger. If anyone has earned the right to be angry – at Israel, at God, at Hamas, whoever, take your pick – it would be this man, this widower who was violently bereaved of three daughters in one day. And yet, he really, honestly does not seem angry. Determined, yes. Grieving, yes. Angry, vengeful, hostile – not at all. Not toward anyone. The more you think about this, the more amazing it is. It’s not that he’s naive or uncritical. He understands the politics at work, and knows there is blame to be laid in the appalling Israeli-Palestinian situation. He’s just decided that forgiveness is a worthwhile pursuit – and hate is not. The first step of failure is to reject yourself. The way to fight injustice is with education. The antidote to hate is not revenge – it is success. He spoke a lot about hate, having clearly spent a lot of time contemplating and discussing it for his book, I Shall Not Hate. He sees hate as a “darkness”, a “shield” through which it is impossible to see clearly, “the fire which eats the one who carries it”. It is the biggest weapon of mass destruction. He chooses not to hate because – besides its being a way to perpetuate suffering – he doesn’t accept being a victim more than once. If you turn to hate after a tragedy, you become your own victim as well as someone else’s. He spoke about people, governments, leaders “waking up” and realizing what peace really means. In his words, the key to peace is remembering each other’s humanity, and discovering how similar we all are. It is shameful to think of humans as anonymous statistics or “collateral damage” (his daughters were referred to as such). We are all somebody’s loved one. We all want the same things. So, obviously, it’s not okay to kill. This is one that gets illustrated worldwide over and over again, but we still don’t seem to get it. In speaking of his wife’s death, he admitted the realization that “the orphan is not the one who loses the father, it is the one who loses the mother. The mother is the one who loves, who sacrifices, who gives. She IS love. She is the one with the big heart.” He believes women are “the balance of the world”, the “key indicator of development” in any country, and the reason we have progressed as far as we have. It is time, he said, for women to take the lead in the world. There is a part of me that has always thought along these lines, but since I became a mother, I believe more fiercely: if women were in charge, there would be a lot less war. I’m not saying that female leaders would solve everything all of a sudden, or that they wouldn’t make mistakes, but maybe Dr. Abuelaish is right: the world could really use a break from ruthlessness. Some feminine empathy, some mercy for humanity, some mama-love. It irks me that so often, the women who are considered good leaders are the ones who demonstrate the most stereotypically “male” qualities (for example, the whole “attack” mentality is considered strong and decisive, and remorse appears to be a weakness). Patriarchy is so ingrained that we forget about the gifts women could offer. There have often been peace movements initiated by groups of mothers, because mothers don’t want war. They work damn hard to create and raise their children, and it is a criminal waste for those children to meet death at the hands of other mothers’ children. Let’s repeat this: killing = NOT OKAY. Because people matter. 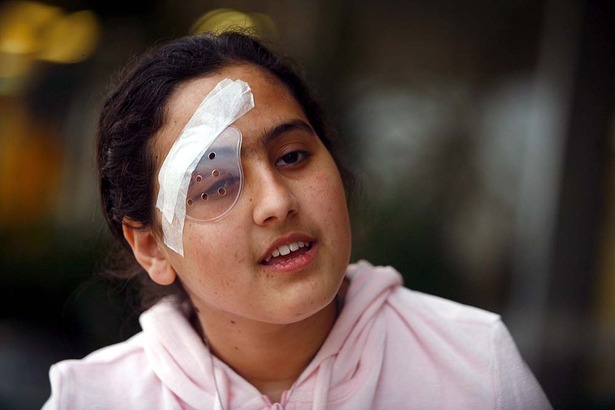 One of the clips in the above video is of a mother who lashes out in anger at Abuelaish during a press conference, for denouncing the actions of the Israeli military. She says her (Israeli) son is in the parachute regiment, it’s necessary to bomb places they think are weapons depots; in his protest, the doctor is disregarding the safety of her son. Once again. Why should any mother have to give her child to war? Why should the most precious product of a mother’s life be expected to kill or be killed? To mothers, it makes no sense, and it’s not fair. (Many fathers too… but not enough, it seems.) Even mothers in societies like Israel, where military service is mandatory and normalized, live in mortal fear of losing their sons and daughters to war. At those words, I felt myself exhale collectively with the audience as, in the midst of this harrowing story, a modicum of sense finally clicked into place. That was the point when I got tears in my eyes. 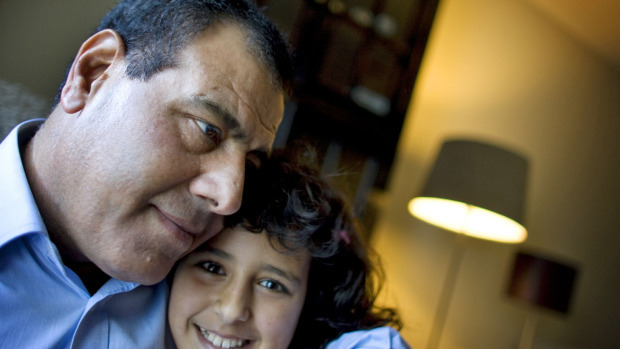 The Abuelaish family, against all odds, seems to be doing well. Three years ago, they moved to Toronto, where they and the neighbouring family decided to dismantle the fence between their yards on the very first day in their new home. In fact, they are in the process of buying a new home now – we know, because our esteemed speaker deigned to take one five-second phone call during the question-and-answer period, and then sheepishly explained it was his real estate agent. We all applauded for him, happy to hear there are reasons for this family to celebrate. I wish I could have found a photo of Dr. Abuelaish’s real, full-out smile – which he finally showed us at that moment – because it is absolutely brilliant. Time for me to read this book. ← Who would you have been when the Titanic sank? Me, too. Maybe I’ll suggest it for the book club! Thanks for this – it was a wonderful thing to read.